Two major players in the portable fridge-freezer market are ARB and Engel. 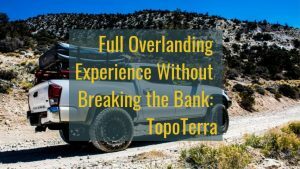 Both are established brands in the overlanding market, but how do they compare? ARB vs. ENGEL. 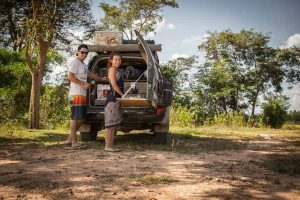 Keeping the food fresh for longer periods of time used to be a major challenge on a long overlanding trip. 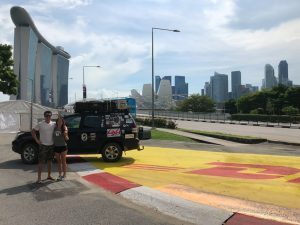 Not to be confused with less effective 12-volt "coolers", both the ARB and the Engel units are true refrigerators/freezers so the task of always having fresh food on an overlanding trip can be easily tackled these days. As an alternative, you can consider (non 12V) good quality coolers, however, that would put a limit on how long can you be out in the wild without new supply of fresh ice. 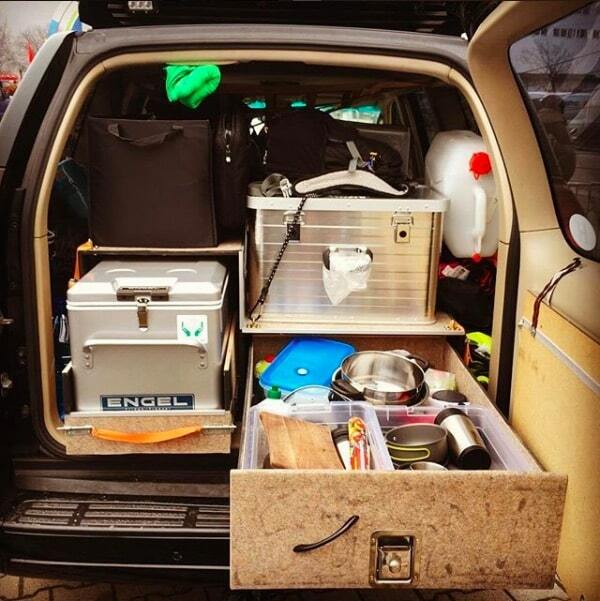 Portability: most of the time the fridge will be sitting in your rig, however, occasionally, you will need to take it out, so size and weight is an important factor. 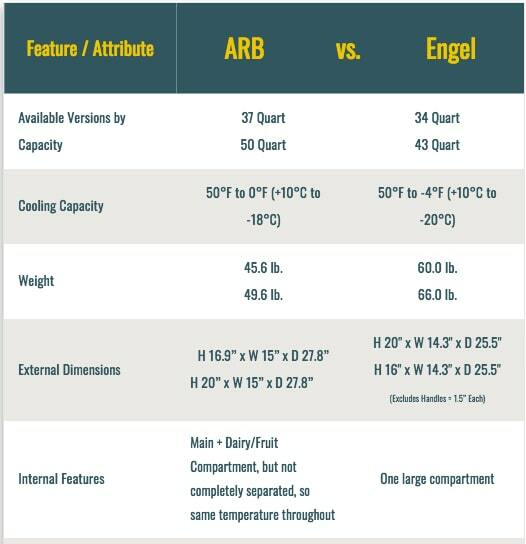 For this reason, in our ARB vs. Engel comparison below, we are going to focus on capacities around the 40 Quart mark. 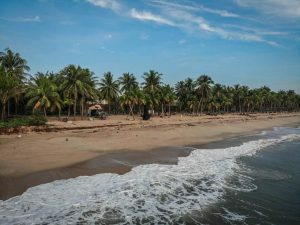 Capacity: before deciding on which unit to purchase, you need to find out the minimum capacity you require on your trips by creating a list of foods you would be taking with you. 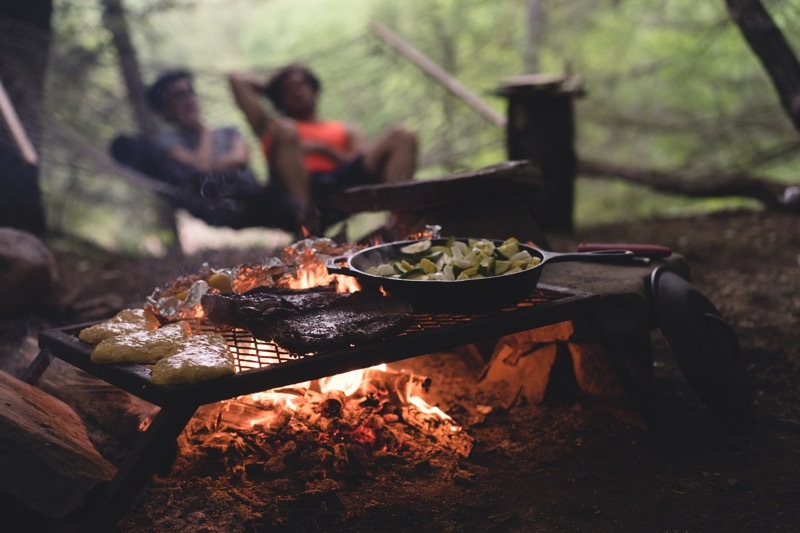 Power consumption: as important as it is not to put too much strain on the electric system of your vehicle, you will need to run the fridge overnight while camping as well, therefore low power consumption is vital. Good insulation: insulation is a factor which is closely related to power consumption. If a fridge is well insulated, it would require less power to keep the contents cool for a longer period of time. This is because the insulation will protect the contents from the outside heat and at the same time prevents the cold from the fridge to escape. Compressor: compressors are the engines of a fridge. The quality of the compressor of a fridge will decide how well it will cool the contents and how long the fridge will last. It is a great idea to take a look at the compressor warranty before the purchase as it would give you an idea of how confident the manufacturers are on the compressors. Dual-zone fridge-freezers: A fridge or freezer has the ability to work as a fridge or a freezer at any given point in time. It cannot act as both at the same time. But a dual-zone fridge-freezer is something which can do both the jobs as the two compartments can act as a fridge or a freezer. Some of it also comes with a removable divider which will help you make the whole compartment a fridge or a freezer. This is a feature of the fridge-freezer which makes it priceless. Read our Engel Dual Zone Fridge-Freezer Review here. 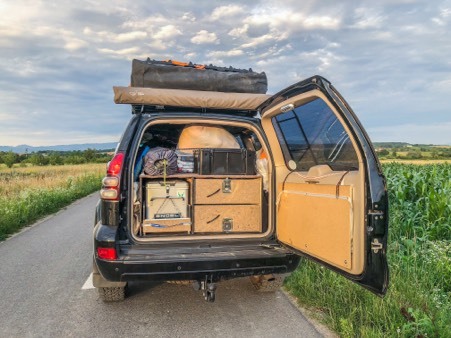 The ARB Fridge-Freezer range is one popular choice among overlanders due to its efficiency and reliability. In the capacity range we are interested in, to keep things in our rig portable, we potentially have two choices: ARB 37 Quart and ARB 50 Quart. The only major difference between the two is the sizes. They have large and strong lids and all have a rear facing LED which illuminates the inside of the fridge to make it accessible when it's dark. Another good option available to you when it comes to fridge-freezers are the Engel MT range of 34 and 43 Quart sizes. The top opening fridge-freezers are known for its automatic voltage choosing feature. It is good with power as the Engel Swing Motor draws only low amperage which makes it run efficiently with low source of power. Ideal for running it from a portable camping power unit, whether that is a generator or an external battery. H 20" x W 14.3" x D 25.5"
H 16" x W 14.3" x D 25.5"
One of the differences that might not be important, but good to know is that the controls on the ARB are on the front, while on Engel fridges are on the back of the unit (but naturally, also facing the user). 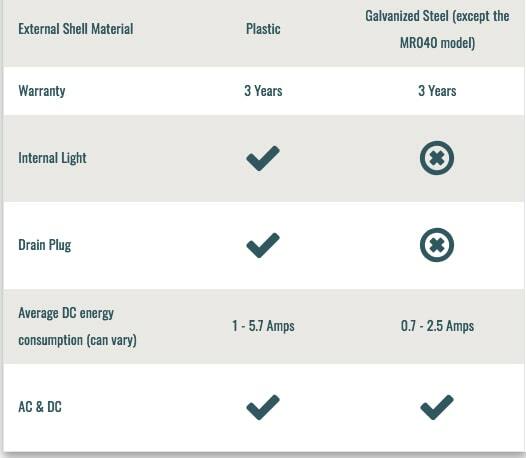 As you can see it in the ARB vs Engel comparison table, there are a few features that are not present on the Engel fridge, such as a drain plug. Having a drain plug on the ARB fridge-freezer, it makes it incomparably easier to clean it than the other brand's product. Another addition we would like to highlight on the ARB is that it has an internal LED light that's really handy at a campsite after sunset. A further difference is that the ARB has essentially two compartments, one they would dedicate to dairy products or fruits. While this might help segregating food, it doesn't mean you can set a different temperature in the two compartments as they are not separated by an insulated wall. Customers are usually very happy with Engel's very low energy consumption and that it can produce even -4°F, however, these differences compared to ARB are negligible. The best argument for choosing an Engel is it's world famous reliability. 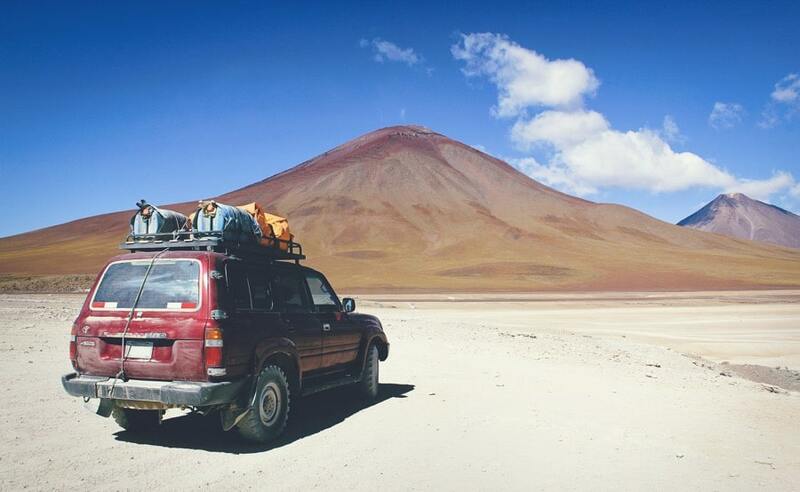 They've been around for decades and as some users testify, they can take a lot of beating on rough roads for many-many years. The downside always mentioned by most of the users for both ARB and Engel is their price. They are on the expensive side, but the features, comfort and the efficiency they offer help you enjoy your trips on a different level. They are an investment worth the money. you are out there in the wild. The ARB and Engel Fridge-Freezers are two great fridges which are both a great choice. ARB does come with small but important features that Engel lacks. That is where ARB wins this comparison, but only slightly. It is very easy to forget these missing features on Engel fridge-freezers though, due to their world-famous reliability. After features, it comes down to size. That will depend on your vehicle, it is quite hard to compare the products this way as they are just different sizes so if make doesn't matter, you have a nice range of sizes to choose from: 34, 37, 34, 50 Quart. Click here to see the ARB or the Engel fridge range on Amazon.